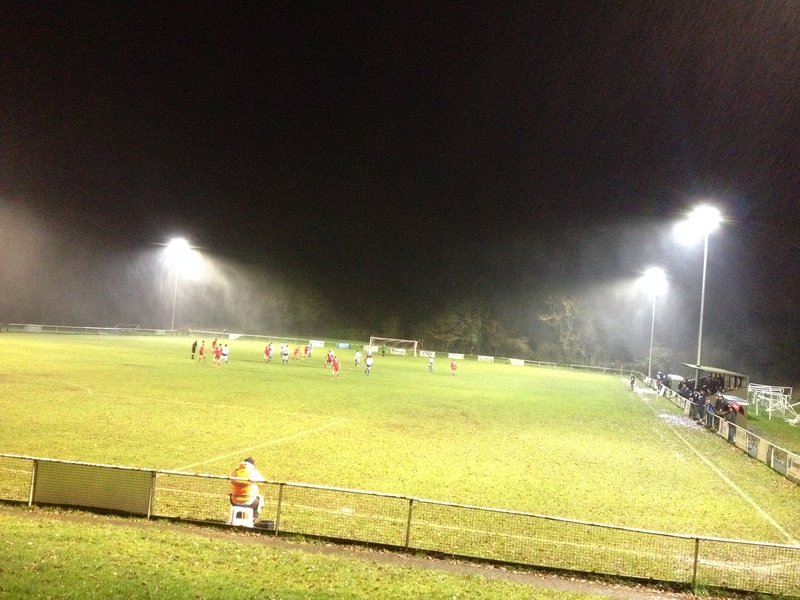 In one of only two matches in the Hellenic League Premier Division to survive horrendous conditions, Ascot United grabbed a crucial three points against local rivals Binfield FC to move into second place. After heavy rain for most of the week, it was unsurprising to see so many fixture lists decimated on the final weekend before Christmas. 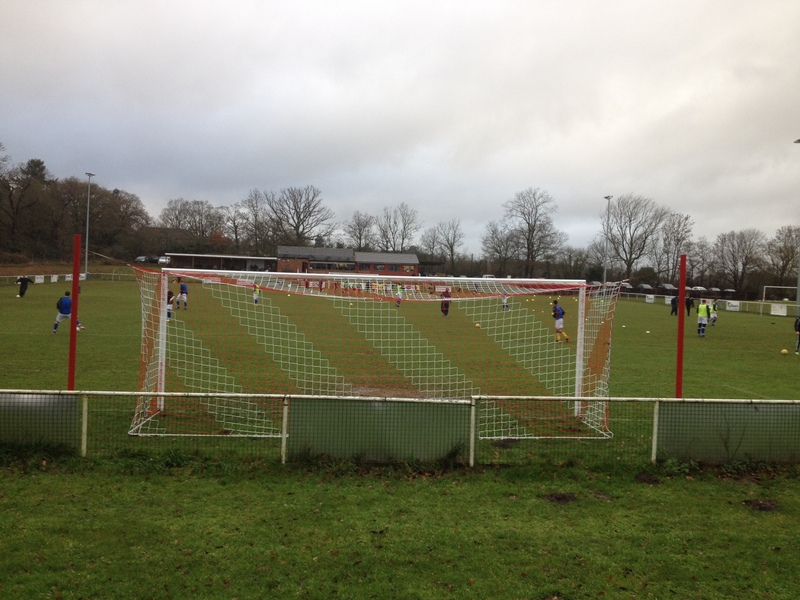 But while many would have resigned themselves to that dreaded Christmas shopping trip, 149 hardy souls braved the mud and rain in the Berkshire countryside to see two teams try and play football in difficult conditions. The rain had abated a little before kickoff, but once the game started, so the rain returned and this time it wasn’t going anywhere! So, armed with a wonderful hot cup of Bovril (other meat based drinks are available!) that you could stand a spoon up in, I retired to the thankfully covered terrace behind the goal for the afternoon’s proceedings. I’ll be honest, I had half a suspicion that we might not see the game through to completion, such were the conditions. On the pitch, and it was Binfield who started brighter, with first Tom Hopper volleying over from a cross, and then Seb Bowerman also clearing the bar after a good run which saw him beat two defenders as he cut in from the left. There were few other scoring opportunities from wither side in the first half, as both sets of players struggled to cope with the blustery wind and rain, and the subsequent effect they were having on the playing surface. Both teams tried to play football, but lacked the quality in the final third, and it was goalless at the break. The second half was an improvement, with James Suarez heading narrowly over for Binfield, and Rob Saunders cannoning a shot off the cross bar for the visitors. And just a few minutes later, Ascot had the decisive goal. Leon Yarnie was dumped to the ground following an aerial challenge from James Rusby on the left. Saunders hit the freekick to the far side of the penalty area, where Justin Clayton was in space. He headed the ball back into the six yard box, and Yarnie fired the ball past Matt Watson to spark jubilant celebrations among the Ascot players. 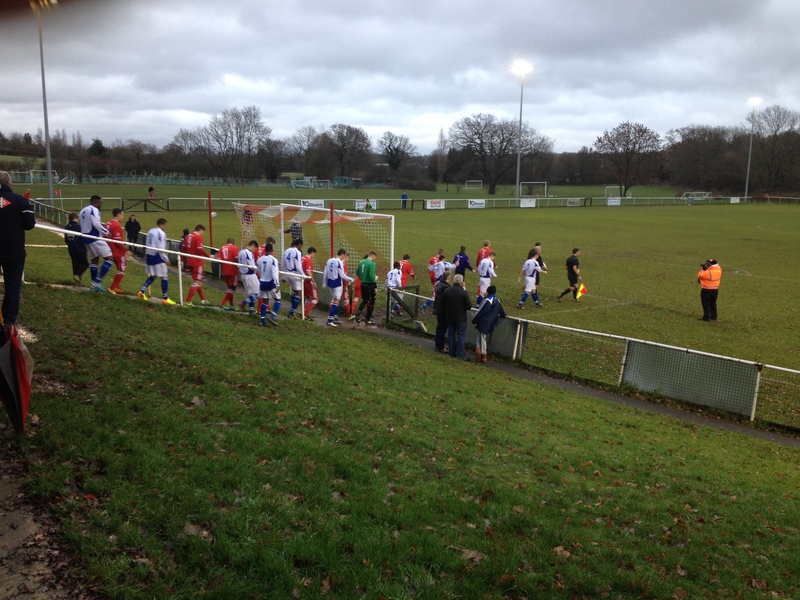 Despite some heavy pressure from Binfield, they could not force a clear opportunity, largely due to Ascot’s bodies-on-the-line style defending. And in fact the visitors could have doubled their advantage when Daryl McLean caught Binfield skipper Callum Whitty in possession. However, McLean then skied his shot, granting a reprieve for Whitty. Ascot, though, did hold on for the win which sees them move to within four points of leaders Ardley United, and in such atrocious conditions, these are the sort of results that can really propel a team on. And, as for me. Do I regret going to the game? Not a chance! 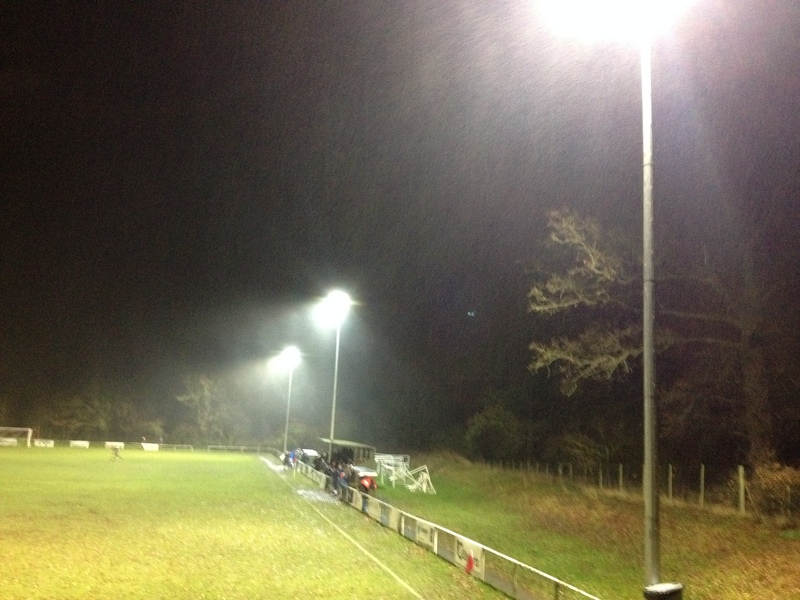 I would rather go to a game in any conditions than go shopping or watch a videprinter churn out the scores on TV. 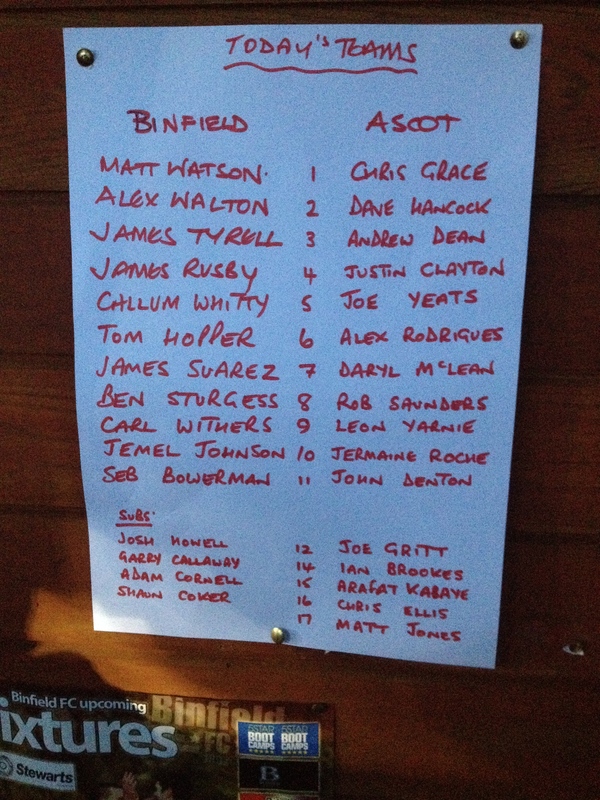 Posted on December 22, 2013, in UTL Archive and tagged Ascot United, Binfield FC, Hellenic League, Leon Yarnie. Bookmark the permalink. Leave a comment.